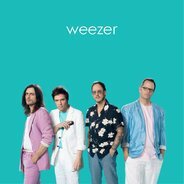 Weezer fans thought they were looking forward to March 1st for the release of the band’s Black album, but we’ve all been surprised today by a new LP on streaming services. It’s called the Teal album because the cover is that weird blue not blue green not green colour, and it’s all covers. Ever wonder where the Weezer does Toto’s Africa comes from? Apparently work for this. We’ve got No Scrubs, the actual TLC song, as covered by Weezer.